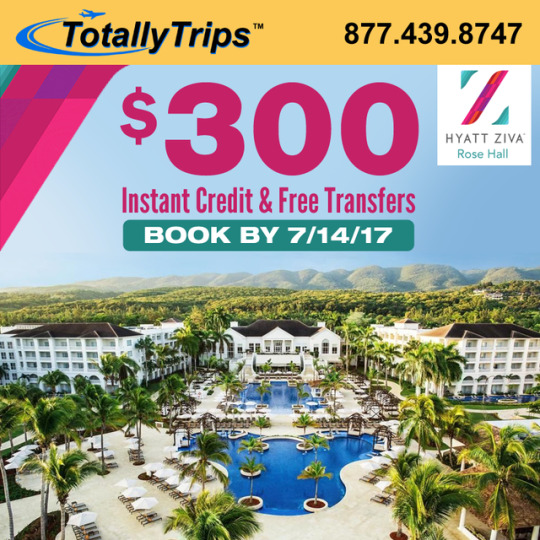 Visit Jamaica this Summer and Stay at the Hyatt Ziva Rose Hall – 3 Nights from $849! Arrive and relax on the pristine white sand beach of the Caribbean Sea. Situated between the sapphire waters of Montego Bay and the Blue Mountains, Hyatt Ziva Rose Hall is a Montego Bay all-inclusive family resort offering the vacation experience of a lifetime. From attentive beach butlers and rum sommeliers to our Zen Spa and 24-hour room service, everything we do delivers The Evolution of All-Inclusive™. Bring your imagination and enjoy exceptional moments. Located 15 minutes from Sangster’s International Airport and 5 minutes from three championship golf courses, you’ll find it easy to experience Montego’s Bays beautiful scenery and attractions. Take off on a zip lining adventure, tee off on the oceanfront White Witch Golf Course or simply relax in our sparkling pools with views of the Caribbean Sea. Indulge your senses at 7 unique restaurants, from Asian cuisine at FuZion to authentic Jamaican fare at Barefoot JerkZ. Our Montego Bay family resort features complimentary airport shuttle from Sangster’s, a KIdZ Club and fun activities, from yoga classes to interactive entertainment. The Hyatt Ziva Rose Hall is a treat for all the senses!